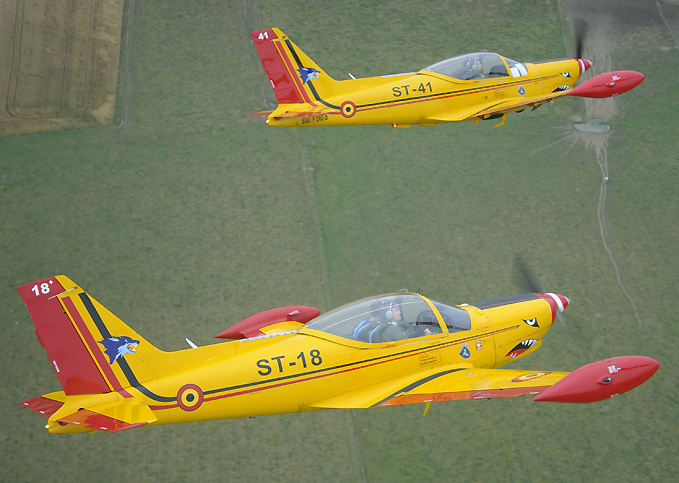 For almost half a century the butterfly-tailed Potez-built Fouga Magister twin-engined training aircraft of the Belgian Armed Forces are crisscrossing the national airspace. Initially forty-five aircraft were purchased in the late fifties as replacements for the worldfamous but totally obsolete NorthAmerican T-6A Harvard trainers as elementary flying training aircraft. These jet-trainers were earmarked to be operated b y the Air Force’s continuation flying training school, based at Kamina Air Base located in southeastern province of Haute-Lomani in then Belgian Congo. Several Fouga Magisters, armed with nose-mounted 7.62mm guns, were used to protect Belgian citizins during ‘events’ leading to the Congolose independence in July 1960. 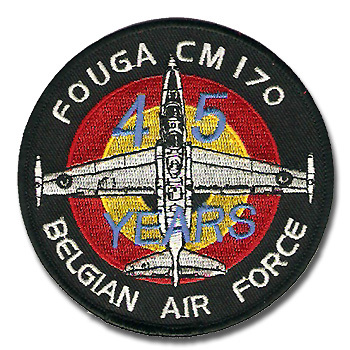 In 2000 the nowadays Democratic Republic of Congo has celebrated the 40° anniversary of its independence, at the same time a limited number of Fouga Magisters of the reformed Belgian Air Componet of the Armed Forces were still used in Belgium operationally as proficiency-aircraft for the service’s high ranking officers, willing to retain their flying qualifications during weekly training flights. In the early seventies five additional ex-Luftwaffe aircraft were purchased to complement the Air Force’s Fouga-fleet, training during almost two decades countless Belgian and (during the early seventies) Dutch pilots. 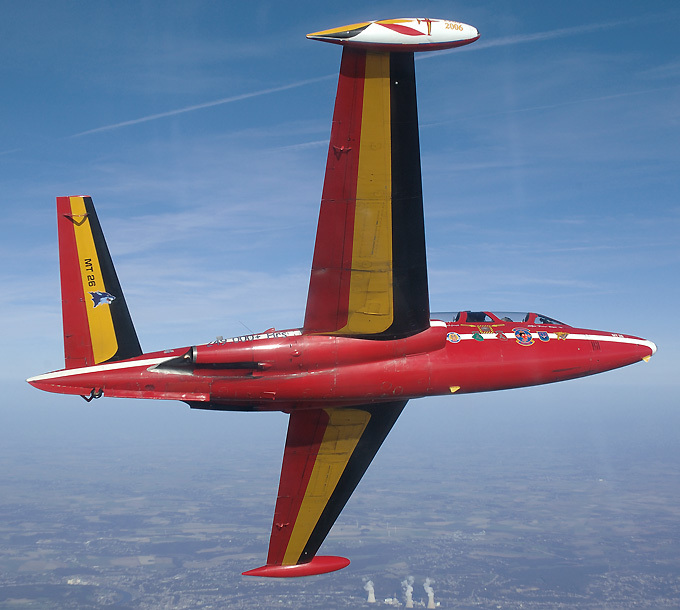 At the same time the Belgian Fouga Magisters achieved national and European renown as tricoloured ‘mounts’ of the «　Rode Duivels / Diables Rouges　» (aka RedDevils) display-team performing for several years all over Western Europe as ambassadors of the Belgian Air Force. In 1975 this display team, previously operating Hawker Hunter F.6-fighters, was disbanded as a direct result of 1973-oil crises related defence cutbacks. T-Birds) and the new generation of supersonic and ‘electric’ fighter jets (Mirage V and F-16A), the Fouga’s were destined to be stored pending (most likely) scrapping. Its low operating costs, abundance of spare parts and the relative good overall condition of the airframes saved the Fouga Magisters from total and irrevocable extinction. A large number of aircraft were divided over the various frontline fighter bases of the Belgian Air Force to be used as ‘liaison hacks’ and proficiency trainers for local high-ranking officers and visiting pilots flying ‘desks’ at one of the various (inter)national air force and/or NATO-Staff units. 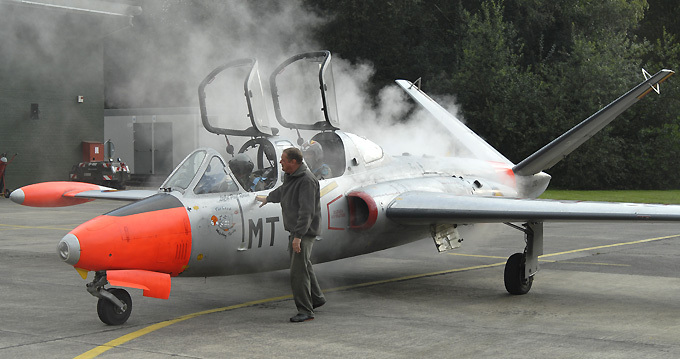 Charmed by the Fouga’s mission-profile and success, the Belgian Air Force even decided in the early nineties to relaunch the aircraft maintenance and overhaul cyclus, stretching the flying varreer of the aircraft. 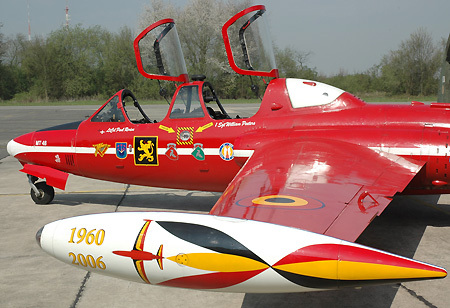 All maintenance was organised ‘in-house’ at Brustem and later on at Bevekom air base, nowadays home of the force’s shrincking Fouga Magister fleet. 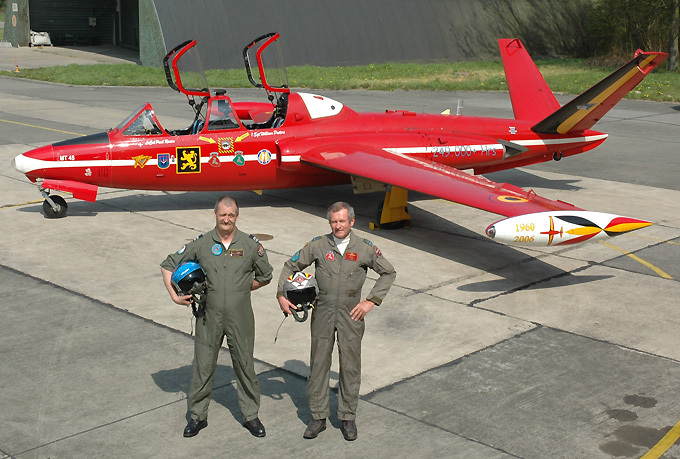 instructor-pilots on the BAC’s SF-260 Marchetti propellor-training aircraft. 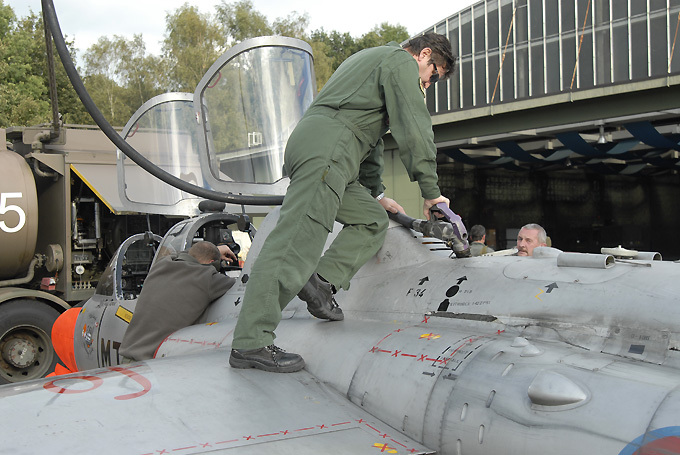 Until 2004, the unit also trained AlphaJet-IP’s, prior to the integration of all elementary jet-training of the BAC in the French Armée de l’Air pilot training structure. 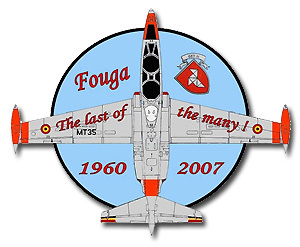 Initially the BAC planned to finally withdrawn the final Fouga Magisters in December 2006, ending a flying carreer almost half a century. 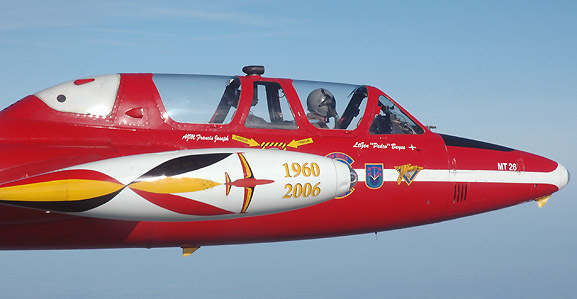 However due to success of BAC’s Fouga Solo and FougaDuo display team, the type will be saved once more for ‘extermination’ since two aircraft will remain in operation well into 2007. The remaining aircraft were gradually grounded having reached the end of their airframe-‘time’. In spite of the high Cabinet-related workload of LtGeneral Buyse and the busy display-schedule of Paul Rorive,the pilots quickly created and trained a close formation display routine, emphasing the elegant airframe during several stunning ‘fighter like’ display manoeuvres. 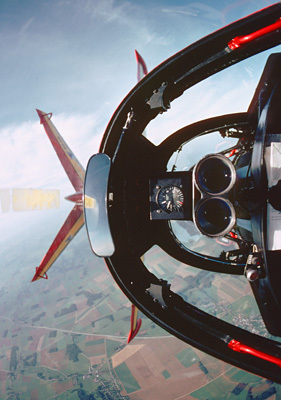 The lack of excess engine powers is hugely compensated by the experience and flying skills of both pilots flying within feet of each other during the routine. 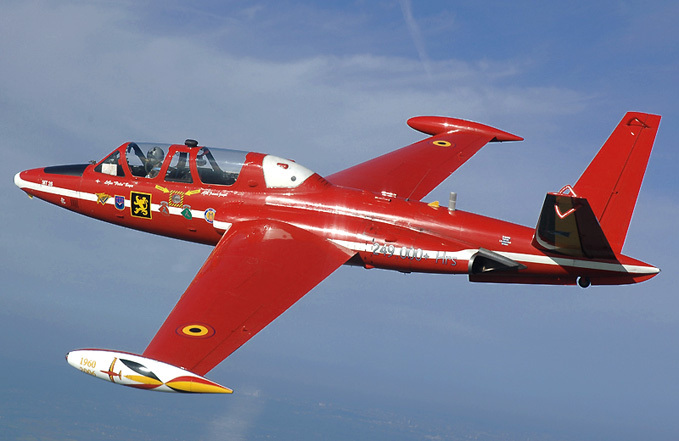 When finally grounded, without any hope of resurrection, the withdrawal of the final Fouga’s will deprive the Belgian Air Component not only from its «　tricolor ambassadors　» but also force all high-ranking ‘desk flyers’ to retrain on the propellor-driven SF260 Marchetti’s…. a fighter pilot’s unjustice? 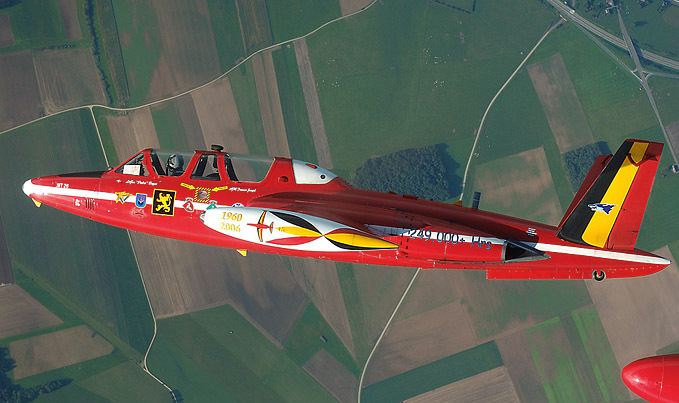 For more then two decades Belgian Fouga Magister aircraft have been regular participants in various (inter)national airshows flying highly inspired displays in specially decorated Fouga-aircraft. 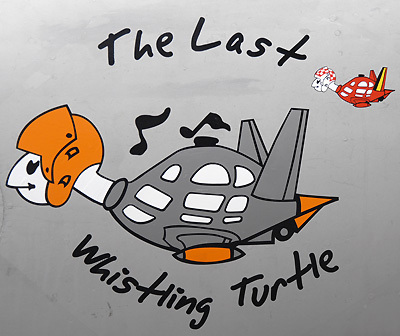 0+) pilots., having gained their ‘wings’ on the aircraft years before. Display-pilot rotation was almost exclusively triggered by forced pilot-retirement at the age of 45, until recently the undisputable maximum ‘flying’ age for ‘Flight Lieutenant/’Commandant’ ranked pilots. 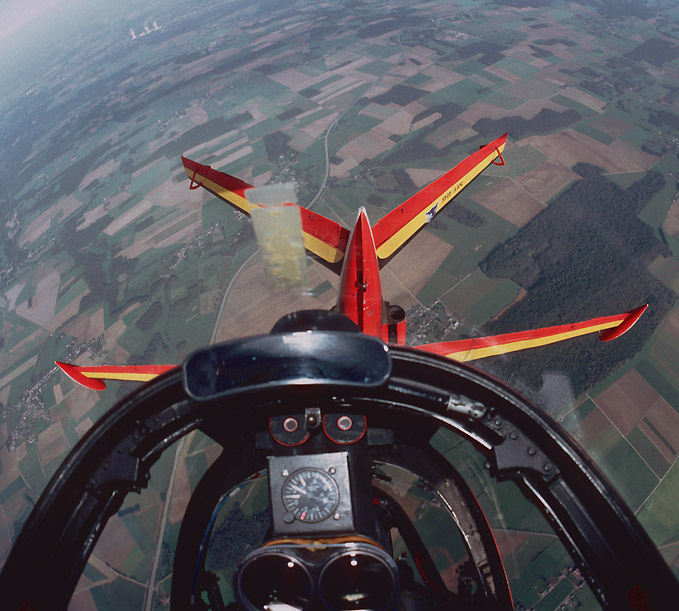 Since 2002 Lt.Col.Paul Rorive, a former experienced Mirage V BA and AlphaJet/T-38 instructor pilot, became the Belgian Air Component’s final official Fouga Magister display pilot. 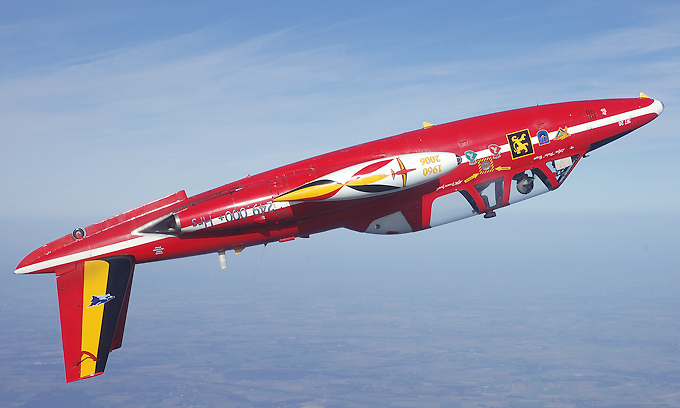 To tribute the «　Red Devils　» display team, the aircraft was painted ia similar striking tri-coloured scheme using wingtip fuel-injection ‘smoke’-tanks to good effect. On average some twenty display were flown in and outside Belgium. 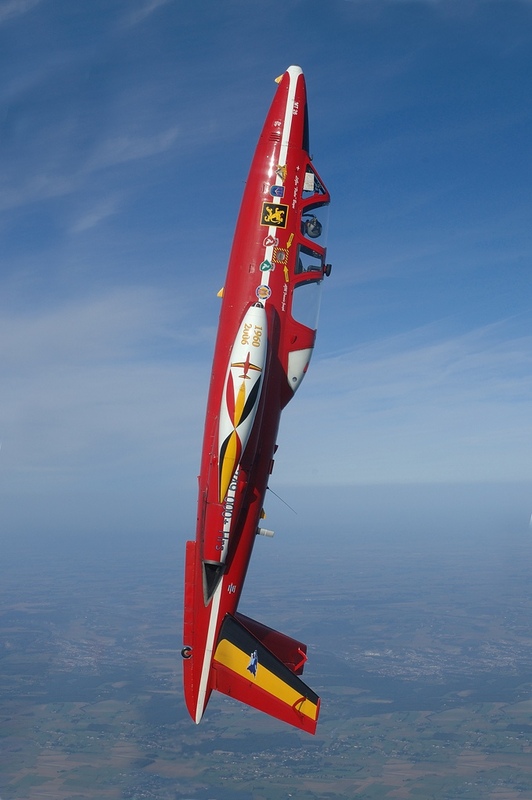 To mark the pending withdrawal of the Fouga’s, Paul Rorive contacted the BAC’s sole «genuine Red Devil»-pilot Lt.General J.C. ‘Pedro’ Buyse to form a twoship display team to complement it’s own solo diplay routine. 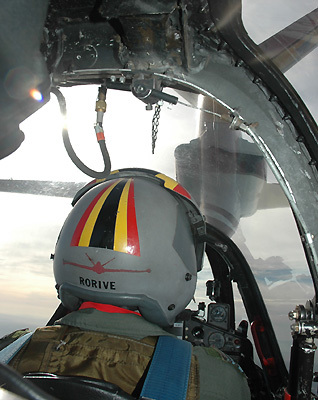 Apart from being the only remaining «Red Devil»-pilot within the BAC, LtGen.Buyse is also the highest ranking officer in the service, being nowadays the Chief of Cabinet of the Belgian Minister of Defence Andre Flahaut.